To the uninitiated, the title may seem like an oxymoron: after all, aren’t hacks what network security is supposed to prevent? 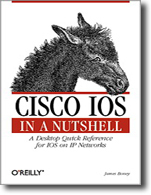 But if you’re network administrator, this book’s title not only makes sense; it makes a lot of sense. You know that a busy administrator needs a hatful of devilishly effective security hacks to keep your 12-hour days from becoming all-nighters. 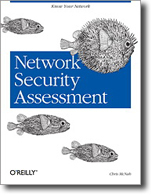 Network Security Hacks is not a long-winded treatise on security theory. 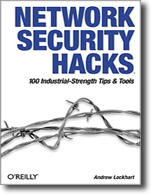 Instead, this information packed little book provides 100 quick, practical, and clever things to do to help make your Linux, UNIX, or Windows networks more secure today. This compendium of security hacks doesn’t just cover securing TCP/IP-based services, but also provides intelligent host-based security techniques. Loaded with concise but powerful examples of applied encryption, intrusion detection, logging, trending, and incident response, Network Security Hacks will demonstrate effective methods for defending your servers and networks from a variety of devious and subtle attacks. Network Security Hacks show how to detect the presence (and track every keystroke) of network intruders, methods for protecting your network and data using strong encryption, and even techniques for laying traps for would-be system crackers. Important security tools are presented, as well as clever methods for using them to reveal real, timely, useful information about what is happening on your network. O’Reilly’s Hacks Series reclaims the term «hacking» for the good guys—innovators who use their ingenuity to solve interesting problems, explore and experiment, unearth shortcuts, and create useful tools. Network Security Hacks lives up to reputation the Hacks series has earned by providing the «roll-up-your sleeves and get-it-done» hacks that most network security tomes don’t offer. Every hack can be read in just a few minutes but will save hours of searching for the right answer. Using just one of these amazing hacks will make this slim book’s price seem like a remarkable deal. The other 99 make Network Security Hacks absolutely invaluable.